The Alexandra Timber Tramway and Museum..... is a tourist railway and museum situated in north-central Victoria. There you can see a recreation of the bush sawmill and tramway era of the Rubicon Fore ..
Alstom, a world leader in transport infrastructure, power generation and transmission. N° 1 in the high and very high speed train sector A promoter of sustainable mobility, Alstom Transport is ..
A volunteer operated organisation, offering heritage train rides and experiences between Queenscliff and Drysdale, on-board a collection of steam and diesel trains originating from most Australian Sta ..
Running through the Goldfields of Central Victoria, the Victorian Goldfields Railway brings to you the experience of Steam Railway Travel. 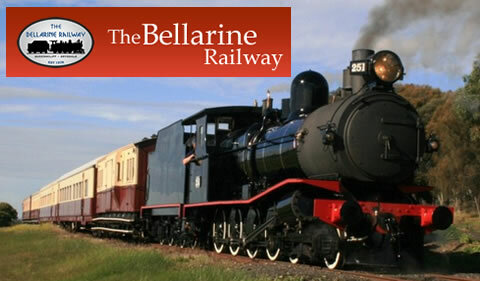 Linking the historic towns of Castlemaine and Maldon, you .. The HOBSON'S BAY MODEL RAILWAY Club (Inc.) was formed in 1988, when a group of then Public Transport workers, got together and decided to acquire one of the many disused government operated Railway's ..
Who does Interstate Freight by rail was the question? Interstate Freight by rail, yes, freight by train.. No one company has a monopoly, but the following companies do interstate freight by rai ..
Kerrisdale Mountain Railway is a unique narrow gauge tourist railway with panoramic views, live steam museum, loco and workshop to tour. The Kerrisdale Mountain Railway is a 2ft narrow gauge touris ..
Melbourne's new metropolitan rail service offering safe and efficient transport to around 400,000 Melburnians every day Connex Trains and Yarra Trams handed over their operations to Hong Kong-based .. Explore the world of Metro Tunnel at our visitor centre, now open at 125-133 Swanston Street, across the road from the Melbourne Town Hall. Our visitor centre is a great place to find out more abou .. The Metro Tunnel includes five new underground stations, with two new city stations directly connected to Flinders Street and Melbourne Central. New High Capacity Trains will run through the Metro ..
Australia's century-old steam train is still running every day except Christmas Day on its original mountain track from Belgrave to Gembrook in the scenic Dandenong Ranges, just 40 km east of Melbourn ..
Information and links on all things rail, railways and trains! RailPage, the premier Australian rail server. Railpage Australia Forum The forum service is an online community bulletin board ser .. The Regional Fast Rail Project is one of the most significant transport initiatives in Victoria's history. The Victorian Government's commitment to the project represents the biggest investment in the .. The South Gippsland Railway runs a collection of historical diesel locomotives and railcars between Leongatha, Korumburra and Nyora along a 36-kilometre section of former Victorian Railways mainline. ..
Southern Cross Railway Station is the most important rail terminal in Victoria and has been redeveloped into a world-class public transport interchange, with fast rail connections to regional Victoria ..
Steamrail Victoria Inc. is a not-for-profit volunteer group which is dedicated to the restoration and operation of historic locomotives and rolling stock. Steamrail Victoria encompasses not only s .. The Overland offers a relaxing way to enjoy the trip between the two cities of Melbourne and Adelaide. The Overland provides the ideal way to travel between Melbourne and Adelaide. With a daylight ..
Victoria has an extensive passenger rail network of metropolitan, intrastate and interstate train services providing vital public transport links to communities throughout the State. The Department ..
V/Line is Victoria's regional public transport provider, operating rail and coach services throughout Victoria. All train and the majority of coach services operate to and from Southern Cross Stati ..
Vicsig aims to provide information on the current operations of Railways in Victoria. From rollingstock, to lines, systems, operations, and the recording of up-to-the-minute developments as the ne ..
Victoria is very fortunate in having such a great diversity of Transport Heritage that has been saved from the late 19th and early 20th centuries. Our historic transport museums including both sta .. The Victorian Goldfields Railway is an authentic steam heritage train linking the historic gold mining towns of Castlemaine and Maldon in Central Victoria. Enjoy a family day out or treat yourself ..
A web site containing information and photographs of Victorian Railway Stations. Victorian Railway Stations is slowly being updated to include every station in Victoria. All the photos included ..
Building on over 20 years' experience in Australian regional passenger transport, the VLocity 160 diesel multiple unit (DMU) provides a flexible vehicle solution through the use of technology that has .. The Yarra Valley Model Railway layout is based on Bacchus Marsh in the 1950's, on Victoria's old main western line. Of course nowadays this line carries mostly passenger services and is no longer part ..
Come and ride the Yarra Valley Railway and experience all the magic of the Valley. The Yarra Valley Railway runs from Healesville to Tarrawarra Estate. The Yarra Valley Railway (YVR) is a comple ..